Debuting tomorrow at lunch is The Wooden Spoon, which brings a new food option to the East Valley corridor (805 East Valley Parkway) that connects downtown Escondido with Valley Center. Up until now, the busy thoroughfare’s food options landscape has been relatively limited, but The Wooden Spoon is hoping to spark a transition in the neighborhood with the opening of its farm-to-table, community-minded restaurant. 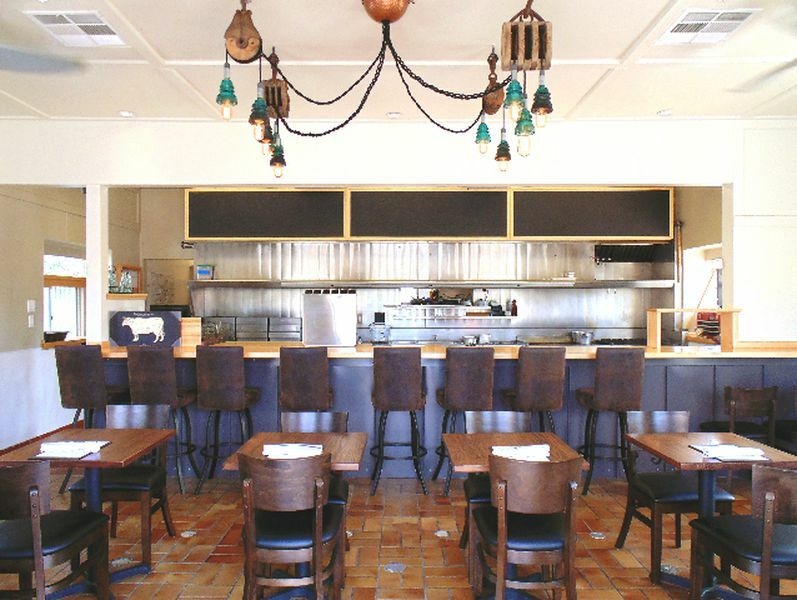 Chef/owner Jesse Paul lives with his wife Catherine and their family in San Marcos and had been looking for a location in North County when he stumbled upon 1960s building that previously housed a Mexican eatery but has been empty for years. With the help of friends and family, he’s transformed and updated the cottage into a 50-seat restaurant with a large patio that will be open from 11:30 a.m. to 9:30 p.m. for lunch and dinner Tuesday through Saturday. Paul spent the last 16 years cooking in fine dining kitchens throughout San Diego; his most recent post was at Vivace Restaurant at Carlsbad’s Park Hyatt Aviara. Though he still carries tweezers in his front apron pocket, the chef says menu for The Wooden Spoon is more in line with the food he likes to eat, describing it as ‘comfort food, redefined’. From his open kitchen, Paul will cook up dishes include a lamb-based shepherd’s pie, house ground meatloaf and vegetarian options, all utilizing local ingredients and housemade elements, from the sausage that stuffs a pork loin served with polenta and greens to their housemade ketchup, pickles, kimchi and sauerkraut; a house charcuterie program is also on the way. Individual plates, including the ‘offal of the day’ will rotate daily, with a thorough menu turnover planned for every season. Paul also intends to host monthly wine and beer dinners or guest chef collaborations that will allow him to exercise his fine dining skills. The Wooden Spoon offers beer and wine, with 85% of the wine list focus on organic or biodynamic bottles. This entry was posted in News, Press on September 11, 2015 . The menu at The Wooden Spoon may look and taste like fine dining but it feels like comfort food, with choices like pork belly bruschetta, potato latkes and meatloaf with housemade ketchup. Located in an unpretentious locale on Valley Parkway near downtown Escondido, The Wooden Spoon serves up scrumptious dishes containing locally sourced ingredients and artisanal products designed to conjure food nostalgia among patrons. The restaurant, which opened for business on February 24, does not accept reservations, preferring walk-in business from the local community. On Tuesday, Paul will open the doors to The Wooden Spoon, a family-friendly 60-seat artisan restaurant in a refurbished Mexican fast food outlet at East Valley Parkway and North Elm Street in Escondido. The restaurant’s diverse menu will change daily, but sample dishes include house-made pork rinds and kimchi, burgers, crispy-fried sweetbreads, meatloaf, shepherd’s pie, blackberry-glazed pork loin and roasted vegetable tart. And everything will be priced at $20 or less. “My philosophy is to keep it simple, use good products, source locally and keep it in season so you can extract the most flavor from every ingredient,” said Paul, who moved to Escondido last year with his wife, Catherine, an elementary schoolteacher, and their children Jack, 13, and Mia, 10. East Valley Parkway isn’t exactly a mecca for fine dining. Most of the area’s restaurants serve fast food or takeout. But Paul said he’s been overwhelmed with interest from local office and hospital workers, residents of the nearby Old Escondido Historic District and commuters who travel the busy east-west corridor. “I think people are hungry for something different out here,” he said, crediting friend and French master chef Patrick Ponsaty, whose menu at Bellamy’s Restaurant in downtown Escondido has helped boost the city’s culinary credentials in recent years. This entry was posted in News, Press on February 19, 2015 .